While most Americans prefer to leave the Constitution’s Second Amendment recognizing the God-given right to keep and bear arms untouched, a large and expanding element of the Democratic Party’s Far Left wants to not only repeal the Second Amendment, it also seeks to confiscate lawfully obtained firearms. Dismissing the fundamental right to keep and bear arms as a “fetish,” Stephens cites a litany of tired and debunked “science” and rhetoric that may do much to ingratiate him to the Far Left urban elite readers of the Times but does absolutely nothing to advance the debate on controlling violent crime. Stephens advocates that America to “fundamentally and permanently” change a “legal regime that most of the developed world considers nuts” by getting rid of the Second Amendment altogether. What happens to the 400 million or so firearms already in private hands? How does society actually benefit from his plan? Stephens doesn’t say. He apparently just trusts that things would eventually work themselves out if the government had carte blanche over yet another aspect of Americans’ lives. And therein lies the Democrats’ real problem with the Second Amendment – it’s not that guns cause crime or the alleged reduction in the murder that could be achieved if firearms were unavailable it is that the only “practical impediments to radical change” are the 400 million or so privately-owned firearms in America. However, Democrats, especially those associated with Hillary Clinton and Barack Obama, have a way around that: the so-called Australian plan for gun confiscation. Irony Alert: Writing for the website Crooked.com, Dan Pfeiffer, a former senior adviser to Barack Obama, laments that he and his fellow radical Democrats are “now in the midst of another gun debate that we will almost certainly lose.” He blames this on Democrats accepting what he calls an interpretation of the Second Amendment that was “reversed-engineered to pander to fantasies.” He then basically argues that just because the U.S. Supreme Court has authoritatively construed the Second Amendment to protect an individual right, Democrats don’t have to accept that as true. As our friends at the NRA-ILA have reminded us, what happened in Australia was not a “buyback.” Gun owners didn’t return guns to the shops where they bought them. Rather, the government retroactively banned firearms that most people had acquired lawfully and in good faith. It then sternly threatened to imprison anyone who didn’t surrender their gun to the authorities for whatever compensation was offered, assuming the individual even survived the government’s attempt to seize the gun by force. Many Australians buckled to the threat, and the government confiscated many hundreds of thousands of guns. But many didn’t. In the unlikely event that a future government of the United States somehow amassed the same proportion of its citizens’ firearms, hundreds of millions would still be left in private hands, but with a disproportionate share hoarded by criminals who need firearms for their livelihood. 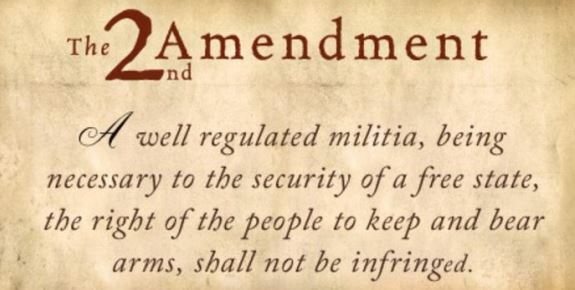 It doesn’t take much convincing for law-abiding American gun owners to understand that in placing the Second Amendment in the Constitution the Framers of the Constitution recognized that there are two elements in every society against whom individual Americans may need to exercise their God-given right to self-defense. The first and most commonly understood element is the violent element that exists in every society that wishes to violate the law-abiding individual through theft, assault or murder. However, the second is the more dangerous. It is the violent element in every society that will violate the law-abiding individual by forcing radical social change upon him, if the practical impediment of individual firearms ownership is removed. As Democrats move further and further to the Left their demands for radical social change will continue to grow, and their readiness to achieve it through violent means will grow commensurately. Individual firearms ownership remains the one practical, and sure, impediment to their ambitions. *We acknowledge the NRA-ILA as a source for much of this article and thank America’s oldest civil rights organization for their advocacy of the rights guaranteed by the Second Amendment. Submitted by Charles Martel on Tue, 10/17/2017 - 03:04. Just as now the Left is coming out and admitting that they want to repeal the Second Amendment, maybe they'll actually admit the real reason for doing so: They know that you cannot impose a Marxist "Dictatorship of the Proletariat" upon an ARMED proletariat!